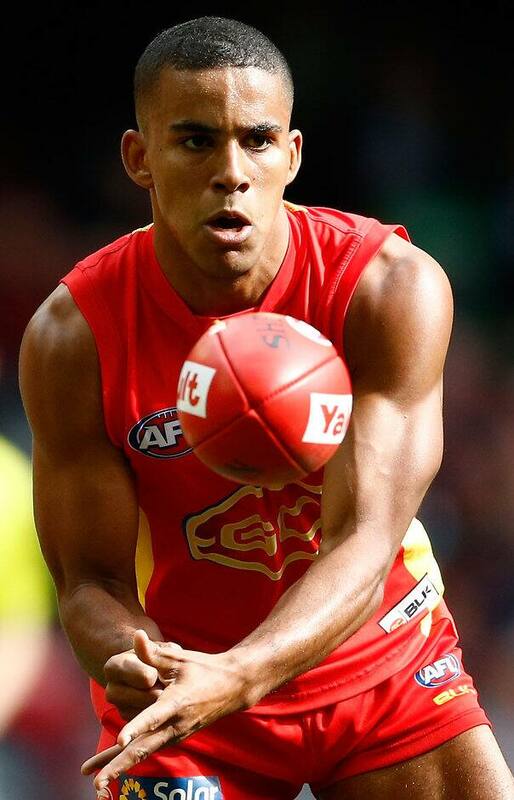 YOUNG Gold Coast midfielder Touk Miller trains and plays with an edge his coach Rodney Eade must wish he could bottle. The Suns could not have asked for more from Miller's first two seasons, playing 40 games and finishing fourth and seventh in his two Club Champion counts. He can play midfield or half-forward, has a defensive mindset, can win his own ball and is a future leader at the club. In an injury-depleted midfield last season, the 20-year-old excelled, so much so that Eade proclaimed Miller would be a certain starter in 2017 no matter which players were available. But after an off-season ankle clean-up, the former Vic Country captain is having none of it. In fact, Miller told AFL.com.au that despite his coach's words, he's nervous about keeping his spot. "With all the new blokes on board I think we're back to a level playing field again, so everything that's happened in the last two years, all the achievements and goals I've hit, don't mean a hell of a lot now," he said. "We've got a lot more midfield strength and strength across half forward. "The new boys coming through and the trades we got are really strong and it'll make it really competitive, which is good." Miller is right, the Suns have had a good off-season, trading in Pearce Hanley and Jarryd Lyons, signing free agent Michael Barlow and drafting Ben Ainsworth, Will Brodie and Jack Bowes, who will all be hunting spots in his part of the ground. Miller's ankle operation has slowed his pre-season down, although he's back to running eight kilometres in a session and will be training with the main group in the New Year. Rehab has been something new for him. Miller did the 1.5km swim and 40km bike ride as part of a team triathlon with rehab manager Alex Rigby at Kingscliff recently. Although admitting he was "nervous-as" before the event, Miller swam and rode strongly. He said rehabilitation had been a tough road. "I was in a cast for a week-and-a-half and on crutches for six weeks. "It's the first time I've been in rehab for an extended period of time. "In terms of handling it, it's been interesting. I've had heaps of ups and downs, moments where I think it's going to take a while to come back. "I'm so eager to get back in and try and prove a point and make a statement." Miller said no-one should be comfortable with their spot – and after 10 wins in the past two years, he's right. "I set my goals as high as I can," he said. "We have the best player in the competition that plays for our club and you want to aspire to be as close to, or as good as, he is. "He has the magic dust, which is hard to acquire, but to be in that realm is where the ultimate goal is. "I'm definitely edgy, especially because I'm not out there playing. I'm keen to get back out there and get cracking. "There's always more to get, more to improve."